For landscape photographers, Saiko (Lake Sai) is the least popular lake among the Fujigoko (Fuji Five Lakes). The number of photos of Mt. Fuji taken from this lake is much less than the other four Fujigoko lakes. The main reason why this place isn’t very popular is that Mt. Ashiwada lies between the lake and Mt. Fuji and thus we can only see the top of Fuji from Saiko. By the way, “-ko” indicates lake so Lake Saiko is a bit redundant translation but I think it is more understandable for those who are not familiar with Japanese. There is one great location for shooting mount Fuji on the lakeshore of Saiko, which is located at the western bay of Lake Sai. This entry was posted in Fujigoko, Mt. 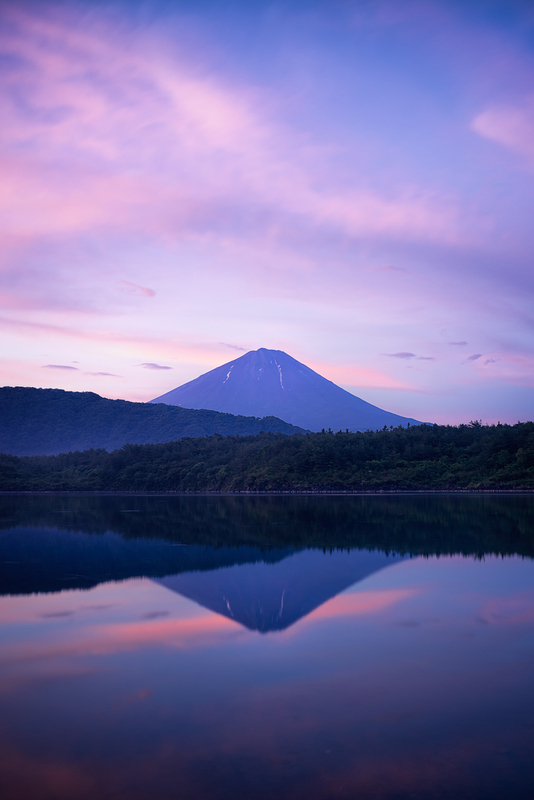 Fuji, Photography and tagged DP2 Merrill, John Cage, Long Exposure, MC-36A, mount fuji, Reflection, SIGMA 35mm f/1.4, ジョン・ケージ, ボート, リモートケーブル, 富士, 富士山, 朝焼け, 西湖, 逆さ富士, 釣り, 長秒露光 on 10/01/2014 by yuga.